In this post, you will find an example of construction and trade professional resume for a professional with experience as an Electrician and Foreman in commercial and residential settings. This page is useful for anyone with an electrical or construction background or even a technical tradesman. 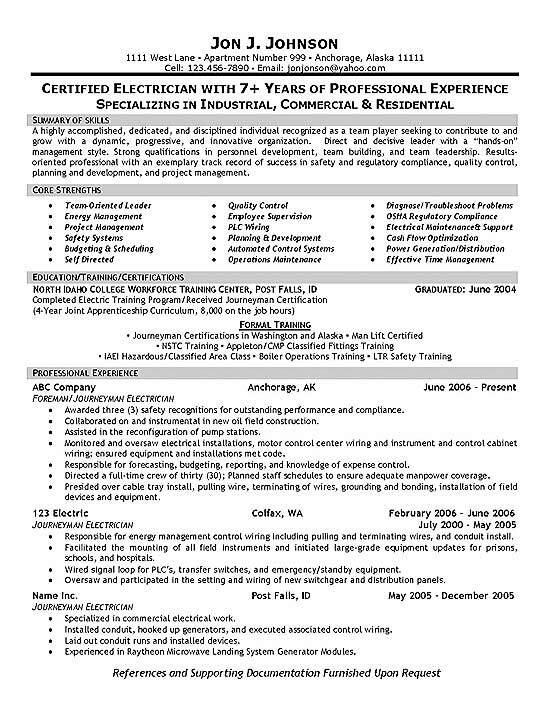 The resume uses a headline statement to emphasize 7 years of experience as an electrician. The job seeker also highlights specialization industrial, commercial and residential environments. The summary paragraph outlines experience along with the list of core strengths that include energy management, project management, supervision, wiring, diagnosis, safety, OSHA compliance and control systems. The education / training section is listed above experience to highlight completion of the Electric Training Program, Journeymen Certification and additional safety /industry related training. The experience section uses bullet points that list a combination of responsibilities and accomplishments. Expertise in the installation, repair, testing and maintenance of electrical systems, electrical wiring, equipment, appliances and fixtures. Adept at analyzing problems and rapidly finding solutions. Strong knowledge of wiring requirements, testing equipment, circuits, meters and industry regulations / codes. Diagnose and replace high voltage electrical power lines, pole wiring and underground lines. Install circuit breakers, transformers, stabilizers, generators and distribution systems. Capable of quickly understanding blueprints, schematics and technical manuals. Manage service calls, troubleshoot electrical systems and resolve issues with equipment. Set up home and business backup generators with auto transfer switches to ensure minimal downtime in power outage. Coordinate with construction contractors such as HVAC, commercial lighting and other electricians in order to ensure wiring is run to correct locations.